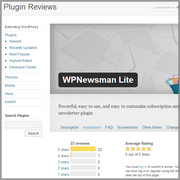 Link to us from your site, for example WPNewsman newsletter plugin for WordPress. Post the plugin review on your blog. By doing it, you’re helping yourself. The more users, the better experience, the more bugs discovered and fixed. We’re doing our best to make WPNewsman flawless, powerful, and simply the best newsletter plugin and we’re saying “Thank You!” for your support. Your likes, shares and comments make us happy!